Son of Mrs. E. Hagerty, of 14, Churchill St., Christchurch, formerly of Timaru. The column "THE FALLEN AND WOUNDED" in the Press of 22 September 1915, page 5, reports: "TROOPER J. M. HAGERTY. Trooper James Michael Hagerty (Canterbury Mounted Rifles, killed in action) was the well-known horseman and boxer. As a cross-country rider he was in good demand in the South Island, and he was engaged extensively as a trainer, acting in this capacity for Mr J. C. N. Grigg when he enlisted with the Main Expeditionary Force. As a boxer he was in the front rank. He won the feather-weight and light-weight amateur championships of Australia and New Zealand, and subsequently he won the light-weight professional championship of New Zealand, holding it against all-comers both from New Zealand and Australia. 'He was one of the straightest boys and one of the finest boxers I have ever met,' remarked a well-known Boxing Association official last night when he heard of 'Jim' Hagerty's death. Hagerty, along with a fellow-jockey, F. Douglas, joined General Godley's staff as orderlies. Hagerty was about 27 years of age. A brother of his is the well-known jockey L Hagerty." THE HAGERTY MEMORIAL : Unveiled at Timaru. Tributes to a Dead Soldier- Boxer. Erected by his many friends throughout the Dominion m memory of the late Trooper J. Hagerty, who was killed at the Dardanelles on August 27, 1915. Greater love hath no man than this: that a man lay down his life for King and Country. Timaru, 17th October, 1916. The unveiling of the memorial took place before a large gathering, the Mayor of Timaru (Mr. E. R. Guinness), Mr. J. Craigie, Member of Parliament for the district, and other representatives being present. All the members of the Hagerty family were present, with the exception of the widowed mother of Jimmy, and his sister, Mrs. Tilly, of Wellington. Their absence was due to the late arrival at Lyttelton of the vessel from Wellington, which prevented the mother and sister from connecting with the first train from Christchurch. Before relating what took place at the unveiling, "The Second" thinks it fitting to remark that it is just possible that Jimmy Hagerty’s memory would not have been perpetuated, as it is to be, had it not been for the activity of a body of Timaru sports, the chairman of which was Mr. C. Sutherland, and the secretary, Mr. Walter A. Pearson. The latter gentleman worked very hard in further promoting the idea of a Hagerty Memorial Fund, and it is due to him to say that had Mr. Pearson not thrown his heart and soul into the movement it would not have proved successful. The success which attended the efforts of the committee must be very gratifying to all concerned. Incidentally, "The Second" in accepting the thanks of the committee to "Truth" for the part it played in furthering the scheme, merely wishes to say that the object was a worthy one, and as such had the sympathy of "Truth." Furthermore, this paper has been asked to express the thanks of the committee to Mr. O. Wise, of Oamaru, the Greymouth Boxing Association, and the Jockey boys of New Zealand, and all who contributed to the Memorial Fund. Incidentally "The Second" also wishes to express the sympathy of the boxing community to Mr. Bennetts, of the Washdyke, Dunedin, on the loss of his son. Corporal Norman E. Bennetts, who fell fighting in France. As remarked 1a these columns last issue, Norman sent his "bit" along from Egypt for the Hagerty Fund. It was a crisp, new English £1 treasury note. Norman Bennetts and Jimmy Hagerty were mates. They were boxers, and members of the same football club, viz., the Zingari, which, by the way, has close on 100 of its members abroad on active service. In addition to the erection of a marble tablet, a cot, "The Hagerty Cot" has been placed m the hospital. There is a balance of £127 2s Id, which has been handed to the South Canterbury Charitable Aid and Hospital Board, and this sum has been invested in war certificates. At the unveiling ceremony on Tuesday afternoon, Mr. C. Sutherland, chairman of the Hagerty Memorial Committee, before asking Miss N. Guinness to unveil the tablet, said that the feelings of all on this occasion were, not pleasant. To many, Trooper Hagerty was a stranger, to many he was a personal friend, and those who knew him, admired him as a straightforward young man and a clean boxer and sport. He had boxed in the ring in Timaru and elsewhere m Now Zealand, and fought for the amusement of many. Later he had fought for the protection of all, and had died doing his duty. Such a memorial as a tablet and a cot, would do much to perpetuate the memory of this popular young fellow. It was the wish of Trooper Hagerty's mother that the memorial should take the form of a tablet and cot, which would be for the use of returned soldiers, He expressed the hope that the cot would be little used by the men who would return. Some people had expressed the opinion that some memorial should be erected to the memory of other men who had fallen at the Front, as well as Trooper Hagerty. At the present time it was impossible to do this, but when the war was over he earnestly hoped that n national memorial would be erected. Perhaps In the capital city, In memory of New Zealand's brave soldiers who had fallen at the front. Mr. Sutherland then called on Miss N. Guinness, who unveiled the tablet which Is erected over the cot. The Mayor expressed his pleasure at being invited to be present at the unveiling of the tablet. Though the occasion wag tinged with sadness, still it was perhaps a source of pride to the relatives of the fallen soldier that such a monument had been erected to perpetuate his memory. He had known Trooper Hagerty, and had seen him In the boxing ring, and when those who knew him well called him an honourable clean-living man and soldier he could heartily endorse their remarks. He had been resent at the farewell to the troops when Trooper Hagerty left for camp, and as a proof of the esteem in which the late soldier had been held the men carried him shoulder high along the platform. Mr. Craigie said he attended the function, not only as a member for the district, but as a representative of the Zingari Football Club, for which Trooper Hagerty had played. He had not known him, but always heard him spoken of as a clean sport, an example of manliness and a gentleman, and his good example had had a beneficial influence on the youth of Timaru. He had learned that one of Trooper Hagerty’s most ennobling qualities was that he revered his mother. He realised fully that of all people deserving of love it was the mother. In this great war the men were not the only ones who made great sacrifice, The mothers of the country had made equivalent to the supreme sacrifice by giving up their sons to fight for the preservation of the Empire. Many men had gone from Timaru and many had laid down lives. He hoped that the sacrifice would not be In vain. Speaking; on the progress of the war. Mr. Craigie said that the outlook was favourable, but no one could say when peace would come. Britain would accept no patched-up peace, but peace on her own terms. Till then the people must resolve to do their best to maintain truth and righteousness. Mr. F. R. Gillingham, chairman of the Hospital Board, said the cot had been formally handed over to the care of the South Canterbury Hospital and Charitable Aid Board. On behalf of the Board he said he appreciated the honour very much. He had not been acquainted with the late Trooper Hagerty, but considered that he was typical of the majority of young men who had gone from Timaru, and who had made a splendid name for themselves. He had done his best and had died, nobly while "doing his bit" for King and Country. The balance of the subscriptions after paying for the cot amounted to £127 2s, and this had been handed unconditionally to the Hospital Board. 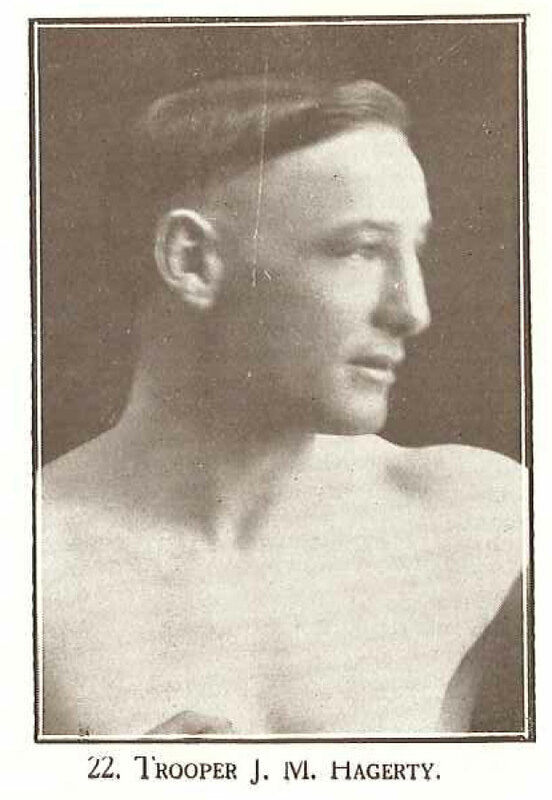 Mr. W. A. Pearson, secretary of the Hagerty Memorial Committee, endorsed the remarks of former speakers, and said that all who had known the late Trooper Hagerty knew him to be a clean sport, honest liver, successful in the boxing ring, and a man who had taken the final "knock-out" blow on Gallipoli like a Britisher and a man. He expressed pleasure at the presence of such a large gathering, and particularly Trooper R. Munro, who had been with Trooper Hagerty to the last. He added that the memorial tablet had been erected by Mr. C. Groves, who also had served in the Gallipoli campaign with Trooper Hagerty. He thanked all who had assisted m any way to erect the memorial. The matron and staff of the Hospital afterwards served afternoon tea to all, and a hearty vote of thanks, proposed by Mr. W. Raymond (Deputy- Mayor), was passed to the Matron and staff.